You are here: Home » News » Industry news » Why Use Air Source Heat Pumps as Hot Water Heaters for Villas? As any who has lived in a villa knows, it does not only cover a large area, but also has many bathrooms and taps. Therefore, the villa's hot water equipment should not only be stable and comfortable, but should also ensure a large amount of multi-point water supply. In the past, villa owners often chose solar water heaters. The installation requirements of solar water heaters are relatively high (for example, sun facing and requiring a large area to place heat collectors), but because villas have their own roofs, this is not troublesome for villa owners at all. In recent years, because of the inconvenience of solar water heaters (such as the high requirement for light when heating cold water, easy to freeze in winter, too small hot water volume, large temperature difference between day and night), villa owners have been looking for better and more comfortable hot water heating alternatives. In this context, air source heat pumps have come to the view of villa users. Air heat pumps need to absorb a large amount of free heat from the air when heating. Therefore, they are especially suitable for being installed in well-ventilated places with a sunny exposure, such as on the roof of villas. 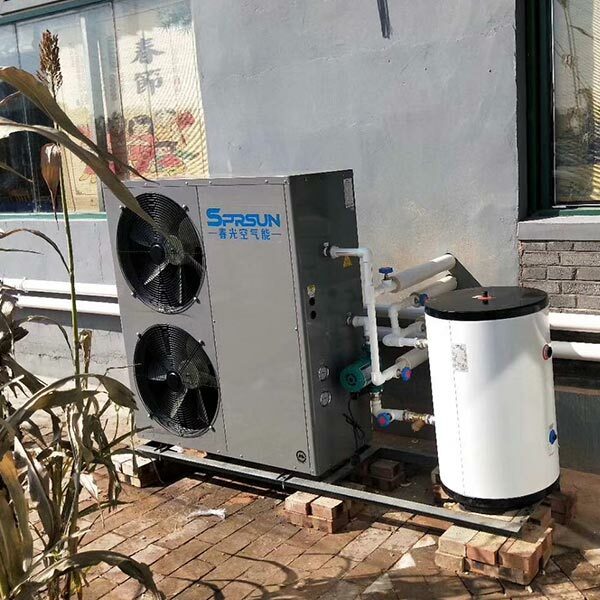 Like solar water heaters, air source hot water heat pumps belong to environment-friendly products. When they are used, there will be no exhaust gas or open fire, thus no gas poisoning or other accidents. Meanwhile, unlike solar water heaters, air to water heat pumps are not affected by weather, season and other factors. Air source heat pumps can work as long as there is air, and can supply hot water steadily for 365 days a year and 24 hours a day.